I recently purchased an art treasure from Japan, a bunny created by Tokuda Yasokichi III (1933–2009). This man was one of the world’s most famous of Kutani potters. The sight of the texturally wonderful rabbit informed me why Yasokichi III was, in 1997, designated a Living National Treasure by the nation of Japan for his mastery of the saiyu glaze technique. 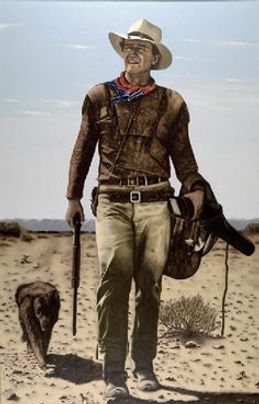 It is difficult for me to comprehend the official designation of a human being as a national treasure in America, for art or for any other reason, not that there are not Americans deserving of the honor. The politics, the political correctness, and the fundamental futility of actualizing such a concept would be horrifyingly dishonorable to the nation of America, and likely to the individual designated to be honored. The prevalence of personal selfishness over a sense of national pride would prevent even a civil discussion of paying tribute to a highly esteemed American. The contentious nature of the argument would likely cause a riot. The fringe elements in American society, publicly behaving odiously and provocatively, have become sensationalized in various mediums to the point where they now take up all the space, all the sound, all the pictures, all the words. Those elements present a false view of America; and, through their unrelenting and vicious cacophony, they attempt to silence any refutation of that distortion. This un-reality is deepened by the dismal misfortune of the brats in America who were bred during the past 30 years with the baneful combination of affluence and not-so-benign neglect. The ghastly parenting mixture of spoil-and-deprive has brought about children in adult bodies who use profanity as a way of acting out their maturity, and who use violence as a way of acting out their immaturity. The incredibly lazy Champagne Socialists, in particular, seem to believe they invented the world they wish to destroy. I’ve seen two-year-olds with more originality, sounder judgement, stronger impulse control and keener initiative toward a positive purpose. Perhaps those adult misfits were the “preschool” brats making all the noise and trashing all the toys that the other children wanted to play with. Not much could be done with those kids back then, and I do mean those “little goats” with their nannies. Back then, their parents were forking over the big bucks to others to mind their brats, and it appears that the American taxpayer has taken over where the parental wallet left off. The size of the Brat Pack is not huge, but it’s a large enough subset of America to create loud, obnoxious mayhem wherever they alight in this Land of the Free and Home of the Brave. At times, that land looks less free and a whole lot less brave. It’s another misperception and missed perception, but to be great is to be misunderstood, and America is great. 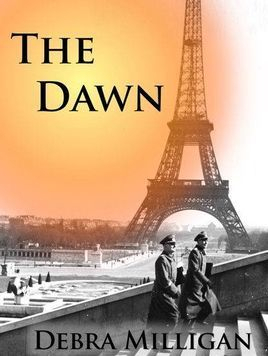 I wonder only if the scriptwriters were speaking of 1900s Paris, 1958 America, or if they were making an attempt at being the film Nostradamus for Western Civilization! Just the one song, “Thank Heaven for Little Girls,” would cause protests, on a lot of fronts, in the politically-correct non-culture of America. The elderly Frenchman, Honoré Lachaille, is a marvelously static character of enormous experience and witty wisdom. He utters the short-and-semi-sweet sonorities of life that blend humor with mellow chagrin, all aged to perfection with time-honored time. His voice of experience sounds refreshingly youthful in its buoyancy! Honoré speaks in this film, with partial irony, of one’s sense of honor, the dignity of man, chivalry and nobility, male patriotism, acting in good faith. Honoré Lachaille was granted immense respect whenever he spoke of such things. To speak of those virtues today is to court mockery from splinter groups who deem themselves the pillars of society. Elevated speech (not to be confused with “elevator speech”) about elevated beliefs has drawn derision and outright assault, verbal and otherwise, from self-anointed elites who possess neither gentility nor good form. They furthermore possess neither courage nor convictions, nor courage of convictions, or accuracy of any opinions; but they seek to demoralize the courage of your convictions, and the accuracy of your opinions. They are a wretched sight. The only honorable response to such coarse contempt is the valor that requires independent thought, as evidenced by the Individual. In essence, every person is a solitary individual. And it is the individual, not the group, who must be the measure of what is right and what is wrong, of what is true and what is false. A group cannot dictate the conscience of an individual, although an individual can work with his conscience in the service of a group to honor both himself and the group. Therein lies the dishonor of those groups of cowardly brats smashing everything that is beautiful and decent in America: moving in herds, they lack a moral compass. They march with moronic madness, moving with fear, frightened by the Individual that truly represents America. They profess to speak as One, but they are as nothing. If it weren’t for the destructive lawlessness of their acts, the absurd silliness of their behavior would largely be ignored. How infantile that violence has now become a way of getting attention amongst these overgrown juvenile delinquents in the United States. The French have an expression, un coup d’épée dans l’eau, that translates to slicing water with a sword: a waste of time, a wasted effort, action with no results. These American malcontents don’t even use edged weapons; they use rocks and bottles. This minority produces perhaps one result: the Image they manufacture, for they are mainly there to be seen. The rest of America finally gets to see the truth about the people who despise this exceptional nation. Arthur states that “one by one” is taking a very long time, and I quite agree with my character! Like the rabbit pictured here, I can become frightened and run away from anything that threatens me; but the truth rarely threatens me. In truth, I find dignity and solace, even some serenity. Truth is not a weapon. Truth is the tribute that the individual receives, as a reward, from his conscience whenever he stands firm on his principles of truth, duty, forbearance, and honor. Those principles light up the darkest night, much like the light of the Harvest Moon. Those principles are, in themselves, the harvest of hardship whenever a person holds true to his code of decency and dignity. Without a code to live by, a person becomes easily confused and lost in the dark. 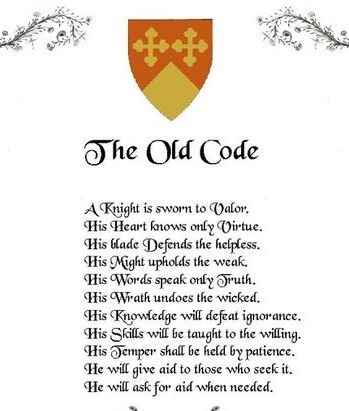 The code of the knight is an old code, and thus it is mocked and reviled by the people who cannot live up to it. Yet that code shines even brighter than the Harvest Moon. It illuminates the truth, and from that truth one can rise to the dignity of courage. That courage is vital for anyone who must abide the assaults of others upon him and his principles, but courage mercifully shields a soul from the shadowy darkness of the lies of others. Truth cannot defeat a person, but falsehood will, sometimes tragically. If the code of the American brats is chaos, and their creed is malice, then it’s no wonder I find it appalling, and sickeningly so, to observe the violent intensity of those thugs of the mindless wrecking crews who, with gross ignorance, hypocritically use the constitutional freedoms of this nation to try to up-end the God-given freedoms of this nation. The individual in America is blessed with opportunities denied to others in lands less free. It is an immense shame for anyone to waste those opportunities on hatred and harm rather than to use those opportunities for industry, initiative, and the individual belief in courage, truth, honor, justice, dignity. It is the American way, to soar like a super person. Only the dishonorable seek to torpedo someone else with rancor and rampant ill-will. Such persons only sink themselves, slowly or quickly, but surely. It’s a wraithlike sight to see, beneath the bright radiance of the sun or the enchanting light of the moon. I choose to look away, to look at the beautiful rabbit on my library table. Inspiration will surely come to me. It did when I first saw this magnificent okimono, which proved to be so much more than an ornament for display or a decorative object. Art, at its best, is aesthetic and practical. So is liberty. It can exist, or it can thrive. In its essence, this Kutani-ware rabbit by Tokuda Yasokichi III spoke to me, of many traditional concepts, cherished, but struggling to thrive in this land called America. Liberty is but one of them. And I consider liberty, like art, to be beautiful, in its form, in its impact, in its very essence. 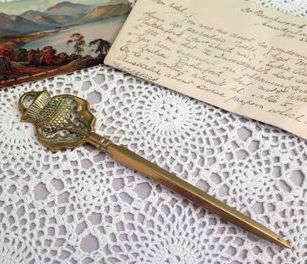 I strive to write with liberty, from duty, with the force of truth that can, hopefully, inspire others to do the same, or at least to think along the noble lines of freedom and beauty. Words do not do justice to the beauty of the noble lines of this sleek sculptural art, but I was inspired to write an essay because of it. Art, history, culture, and their traditions: they are all interwoven. And they all somehow demanded that I honor not just this artist, and his work of art, but the quiet path that he took in performing his art. It was a path of upholding tradition, reclaiming tradition, and augmenting that tradition through his love of his art. To a large degree, the artist, and the artisan, are the loving guardians of tradition, which is a building block of civilization. Art without tradition is a series of cave paintings. Art, and civilization, throughout the world, richly deserve much more from the generations that will lead each nation into the future. America deeply deserves the liberty to treasure its traditions, and to treasure its national treasures. Those treasures do include people, as well as works of art. Those treasures, traditions, and art forms were handed down through the generations from foremothers who sacrificed their liberty, and sometimes their lives, to give birth to the next generations; and from forefathers who sacrificed their blood and often their lives to ensure the very same liberty that is currently dishonored by les enfants gâtés, the spoiled children who dabble in desecration with hypocrisy and use injustice to proclaim justice. With every monument destroyed, the zealot reveals his hatred. For every statue defaced, the coward is disgraced. Those works of art are pieces of history, and their artistry, along with that history, will, in the course of human events, only become more understood, with all of their meanings, even as those heinous hypocrites who befoul them will soon be forgotten. History and national treasures go hand-in-hand. The pawns of history are the ones who end up in the dustbin. These ignoramuses of history tragically repeat the maligned portions they portend to erase. The artistry of creating honor and dignity, through duty and love of country, there is the living national treasure that is every proud American. The artistry of this ceramic rabbit resides in its elegant form, but also in the traditional golden yellow finish that this embodiment so richly deserves. 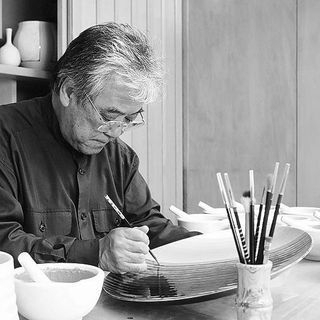 Through renowned glaze techniques developed and perfected by the Tokuda family, and reclaimed for future generations by this Japanese individual; and with the traditions handed down to him from his father and from his grandfather, this artist, Tokuda Yasokichi III, became the National Treasure of Japan, a Cultural Asset. It was an instance of the wonder of the individual, who through time-venerated traditions, created his own design and glaze techniques, his own artistry of beauty and of blessings for others to cherish. The Harvest Moon is also an instance of wonder, the wonder of nature. It signifies a time for the gathering of crops. Its early rise and intense illumination allowed farmers to harvest their crops long into the night. Beneath that Harvest Moon, there is the magic of memory, the chimera of creativity, the spell of time eternal, of many a moon, not merely the reminder of arduous labor in gathering what was sown. There is also boundless joy in reaping the bounty that has grown. 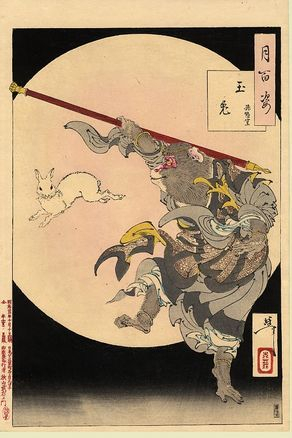 In Japan there thrives a wondrous belief that there’s a rabbit on the moon, not a man. During the season of the Harvest Moon, you can see the rabbit up there, content and happy, making mochi, pounded rice cakes, with his wooden mallet. This poetic image, with its quiet productive happiness, guides me through this season of the Harvest Moon, with its abundance of bliss and delight; and it guides me into the next season, with its blessed gifts of hope for the future. The use of the moon -- for practical purposes as well as poetic imagery -- in my writing is extensive and profound, particularly in THE DAWN. Because so much of the action takes place in a French village without electricity, I had to “live” with the moon phases in mind for a lot of that "time" of composition. It was not a difficult task for me since I have always felt an affinity with the moon. It was infinitely inspiring for me to imagine a life where the light of the moon informed a person about so much. That sensibility led me to other pieces of writing. In 1999, I read a book by Robert Lacey, The Year 1000, which was about medieval England, long before this long-ago era became cable-tv-fodder. 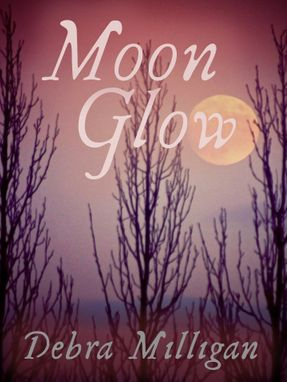 The imagery that I envisioned while reading those pages has stayed in my mind, of people looking to the moon for so many necessary aspects of life. 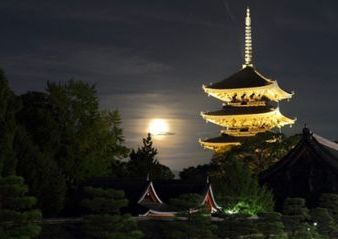 The Japanese tradition of tsukimi, the viewing of the Harvest Moon, this autumn moon, is one aspect of life that I appreciate and admire. With the tenderness of those moon beams, I can dream of a golden future. I can treasure a life that is simple, serene, in tune with time, which is say, time-honored time. Life is too short to permit any season of your life to become fruitless and bitter, like the chaff that the wind of dissension drives to your door. That chaff is composed of anarchy amidst delusions about the country named America. Far better to anticipate a future of hope and the harvest of happiness. Far better to remain unafraid about the world around you that spins in ways it was not meant to spin. 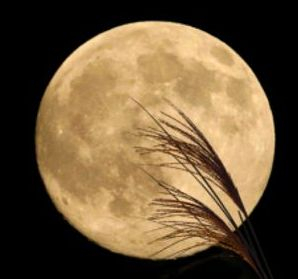 The honor of the Harvest Moon requests of us repose and reflection, and resolution. This radiant moon requests of the individual the boldness of sincerity. Beneath its glorious beauty there is poetry: the wonderment of liberty, the freedom to live, to love, to be the best that we can be. Let us honor the proud productivity of a rabbit on that moon. Let us happily grant the requests of the Harvest Moon, with gratitude, and with the sublime serendipity of moon glow.